The 10.6m StreetAir EV DF outside the Dunsilly Hotel. (LtoR) Ian Downie, Dr William Wright CBE, Bob Brayshaw and Jim Morrison. The two StreetAir EV demonstration vehicles caught during a brief break in the clouds at Nutt’s Corner. Ian Downie at the wheel of the two door 10.6m StreetAir EV DF. The 10.6m StreetAir EV DF is based on a standard StreetDeck chassis with no change to wheelbase or overhangs. The 9.5m StreetAir EV WF in front of the 10.6m vehicle and the MAN box van which has been equipped as a mobile generator and charging station. Interior of the 9.5m StreetAir EV WF, first built in 2012. The 9.5m StreetAir EV WF on the circuit. 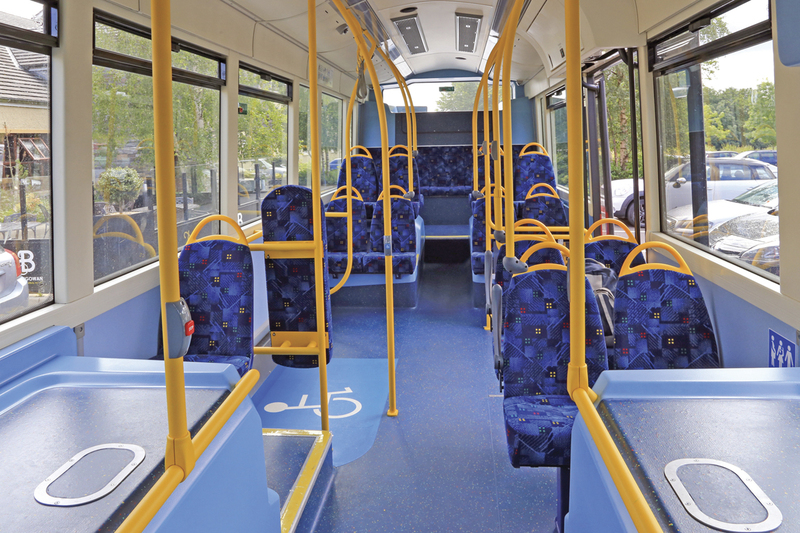 The interior of the 10.6m StreetAir EV DF is to TfL specification although some final details have yet to be added. Opening the rear panel of the 10.6m StreetAir EV DF reveals the 300kWh NMC battery pack. 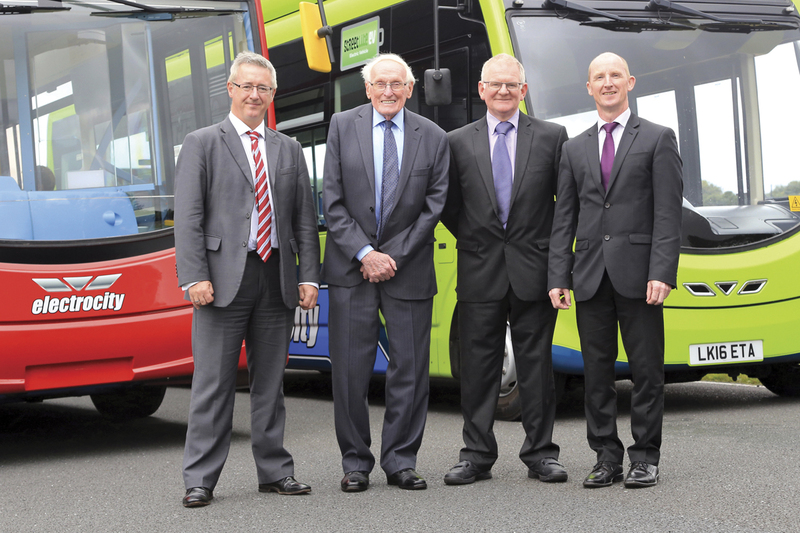 Appropriately timed, given the recent announcements on OLEV funding, the progress of Wrightbus’ development work was unveiled when the press were welcomed to Antrim’s Dunsilly Hotel by Dr William Wright CBE, CEO Mark Nodder and MD Sales Ian Downie, accompanied by Jim Morrison and Bob Brayshaw from the alternative driveline development team led by William. 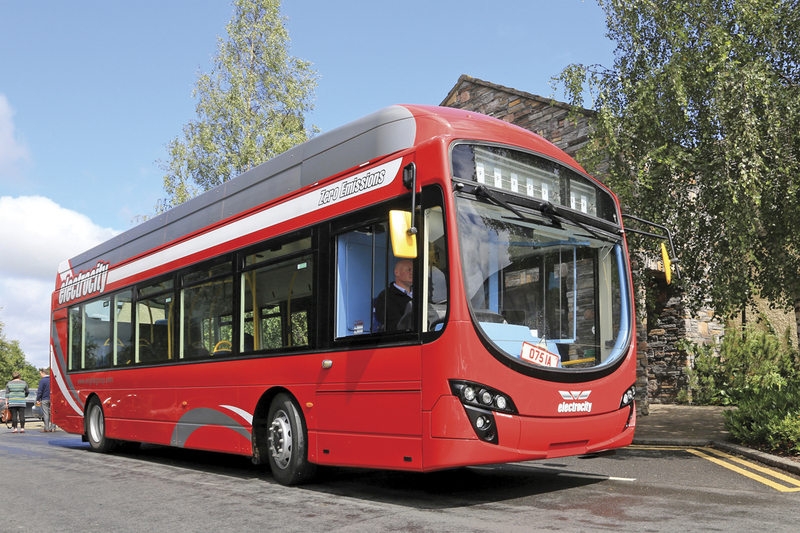 The ride and drive event was the first preview of the latest Wrightbus zero emission range that has been given a single model name StreetAir. The initial vehicles are all full electric and thus StreetAir EV although other concepts could follow on a common platform. 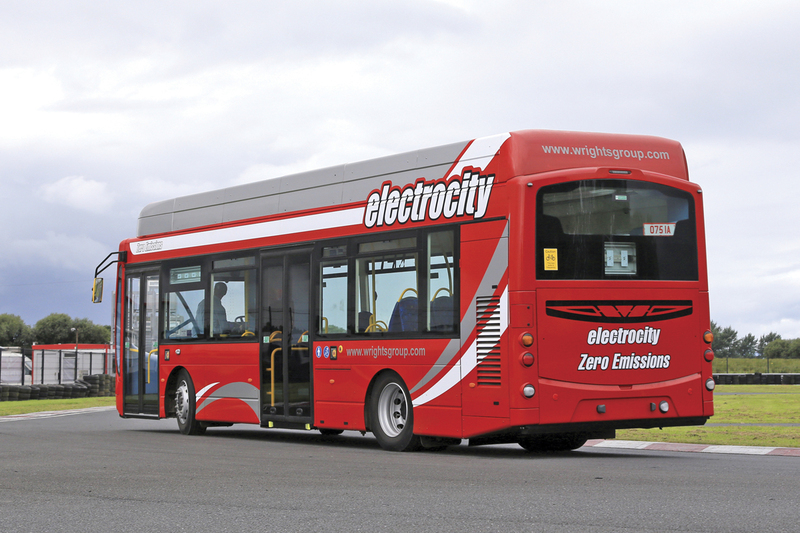 Jim Morrison outlined Wrightbus’ design challenge for the latest additions to the StreetAir range which was to develop both single and double deck zero emission vehicles based on a common 18 tonne platform. The modular design was to offer three charging options and two battery technologies with the flexibility to specifically tailor a solution to the individual requirements of the operator. In parallel, a zero emission heating system was a requirement. The StreetAir EV WF is based on the AluminiqueTM StreetLite structure and will be available at 8.8m and 9.5m within a GVW of 13tonnes. The vehicle provided for the event was to the longer length, overall dimensions being 9.48m long, 2.445m wide and 3.3m high over the roof structure. 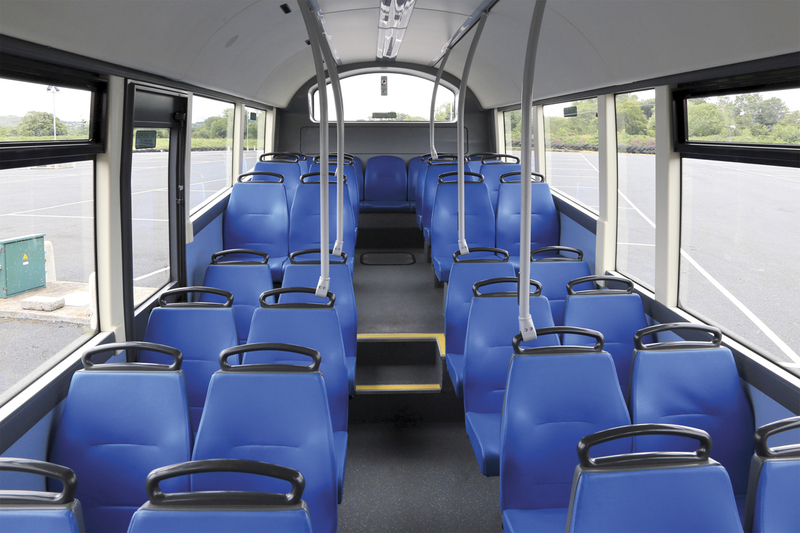 Its passenger capacity is 54 with 37 seated in a single doorway format, 17 of the seats being in the low floor area. This vehicle was originally built for development and demonstration purposes in 2012, appearing at EuroBusExpo that year, and was first registered in 2016 after receiving a second electric driveline upgrade. This was in preparation for a successful tour of Europe that took place in the spring, covering over 4,000 miles demonstrating to a variety of operators in 21 cities in Switzerland including the capital, Berne. It was also the first bus over the Gotthard pass after clearance of the 2015/16 snows. In its latest form, it is equipped with the Siemens ELFA® II electric drive system and a Nickel Manganese Cobalt (NMC) battery back optimised to give a range of 130-150 miles based on plug-in overnight charging. Lithium Titanium Oxide (LTO) batteries will be specified for the inductive power transfer (IPT) and opportunity conductive charging applications which are available on the same platform. IPT but with a 150kW NMC battery pack is already in use by the Streetlite EVs which have covered some 800,000km during their first 2.5years service in Milton Keynes. 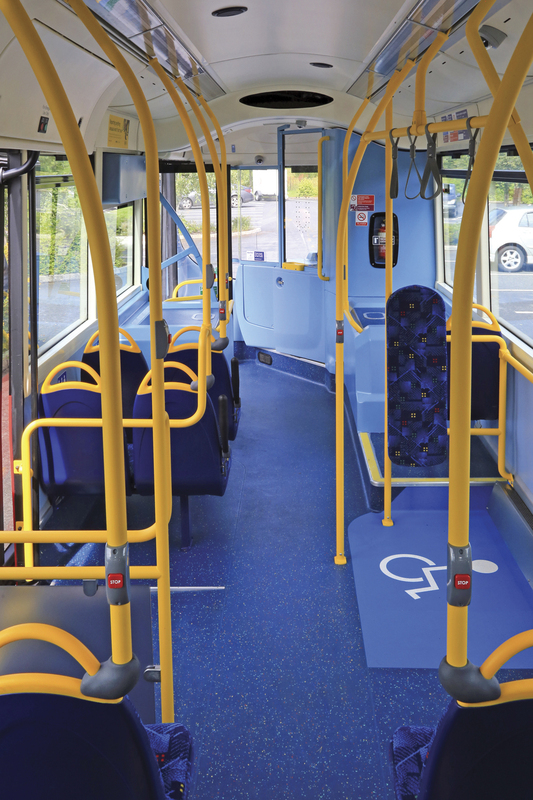 Maintaining significant commonality with the StreetLite range, the StreetAir EV WF features independent front suspension, rear air suspension, ergonomic drivers area conforming to ISO 16121, central offside emergency door in the low floor area and daytime running lights. Power steering and hydraulic systems are electrically driven and an electric heating and ventilation system is installed. 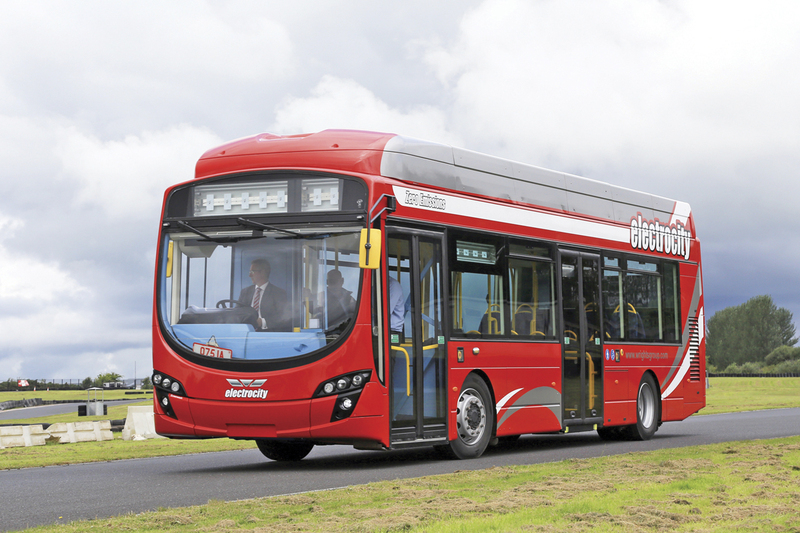 Unveiled at the event in 10.6m dual door single deck format, the StreetAir EV DF is the Wrightbus solution in the 18tonnes GVW category for single deck vehicles up to 12m and double-deckers. It is built on the current StreetDeck chassis and uses many common components with that model in the AluminiqueTM body structure including a standard wiring loom. The front and rear styling is based on the Eclipse 2 design and the fairings concealing roof mounted equipment have been neatly integrated into the design. Maintaining commonality across the StreetAir range, it is equipped with the Siemens ELFA® II electric drive system and a 300kWh NMC battery back optimised to give a range of 150-180 miles based on plug-in overnight charging. Inductive power transfer (IPT) and opportunity conductive charging applications are available on the same platform. The electric motor drive line is common to the New Routemaster. The StreetAir EV DF features independent front suspension, rear air suspension, ergonomic drivers area and daytime running lights. Power steering and hydraulic systems are electrically driven and a zero emission heat pump based electric heating system is installed. 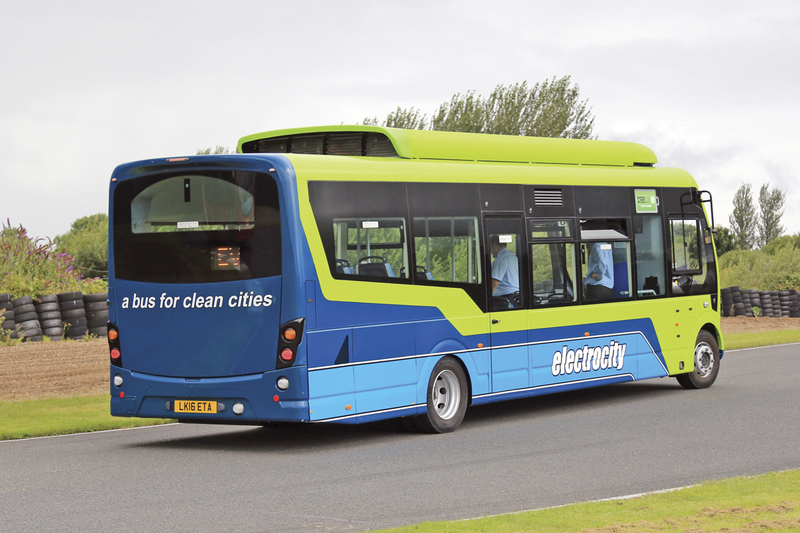 Understanding battery types and the way they perform is core to the successful development and operation of electric buses. When the first steps into electric buses were being taken, the technology was basically still that of the milk float with lead acid batteries. Energy capacity per kg of battery was low and gave a very limited range. 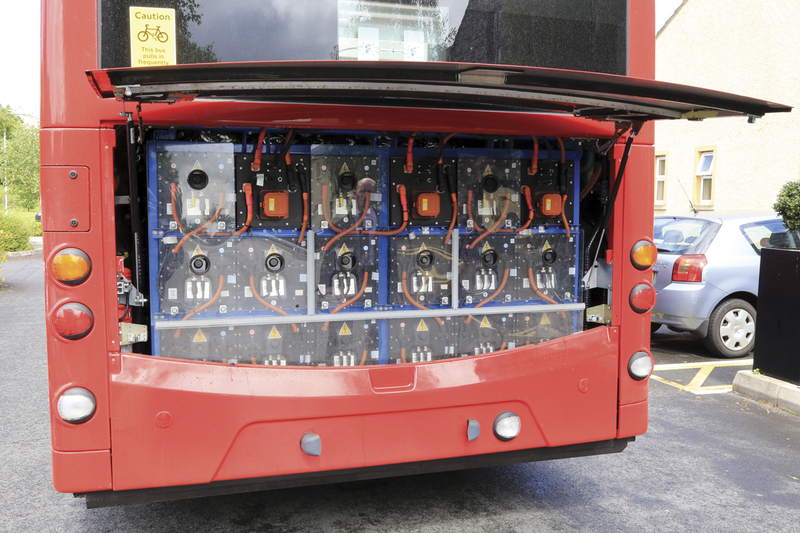 Lithium Iron Phosphate (LIP) batteries have improved the energy capacity but have limitations on recharge cycles as demonstrated by issues with some New Routemaster battery packs. Further improvement comes with NMC and LTO batteries used for the StreetAir range whose differing properties support alternative applications: NMC is a high energy battery suitable for long duty and overnight charging applications due to its lower power capability. In contrast, LTO batteries with high power capability are more appropriate to rapid charging in applications featuring inductive or conductive opportunity charging and in hybrid vehicles. 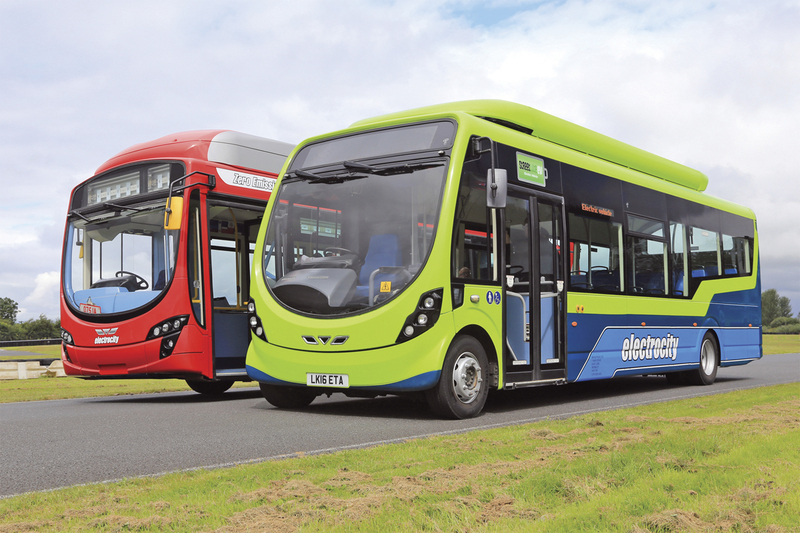 Battery weight remains a challenge and, although other manufacturers have met the challenge of 12m vehicles with dispensation for 19tonnes GVW, Wrightbus’ intention is to work within the UK 18tonnes limit. The benefits of this include being able to offer additional capacity as battery weights decrease and minimising the power required to move the weight of the vehicle itself. 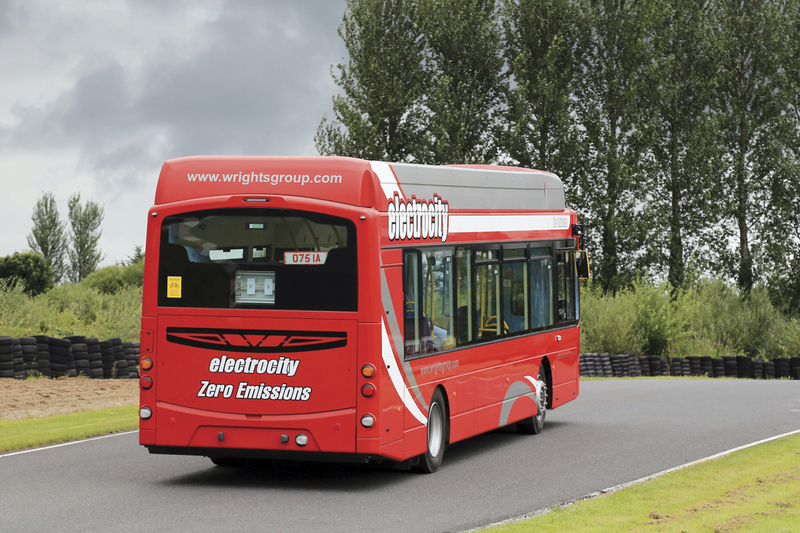 Wrightbus is also committed to full electrification of the vehicle’s heating and air cooling requirements, applying heat pump technology to achieve better utilisation of the power consumed. The challenge is to reduce the weight of this technology, particularly where cooling is required, to minimise any impact on total passenger capacity. Wrightbus customer support for the StreetAir range encompasses both pre order support in selecting the right vehicle and battery option and operational support through Customcare. A simulation programme has been developed to analyse either an individual route or city network to determine the optimum battery capacity, chemistry and charging methodology as part of a package offered to operators with the vehicle. A cloud based remote diagnostic system has been developed by Customcare that will provide operators and the manufacturer with full real time details of vehicle and battery performance, faults and their clearance together with GPS tracking. The system will be customisable to users’ requirements. All Wrightbus products carry a standard two year warranty but there will be no one size fits all solution in respect of battery life warranty. These will be appropriate based on the planned product usage. The Customcare remote diagnostic package is one measure to maximise battery life, another is active battery management software which is developing rapidly, recent battery chemistries allowing the balancing to happen whilst in operation thus minimising the need for overnight charging or balancing on opportunity charged vehicles. Travelling down to Nutt’s Corner gave the opportunity to experience the 10.6m StreetAir EV DF in normal traffic conditions through Antrim. Lightly loaded, the ride was stable if somewhat firm, particularly along the poorly surfaced approach to the circuit. The interior features comfortable Isri Civic V2 seats although not many of them with the TfL specification interior offering separate spaces for a wheelchair and buggies as well as standee room. The vehicle was still ‘work in progress’ with some small details such as the on board passenger information monitors yet to be fitted. The general fit and finish was however very good for what was, bodywise, a basically hand built vehicle. Noise levels were low with the majority generated by auxiliary equipment and it was easy to hold a conversation at normal voice levels. Before taking the vehicles onto the track, there was a short briefing on the key points of the circuit, mainly the need to avoid the start line gantry that extended part way across the carriageway which was coned off to suit. The opportunity was taken at this time to briefly demonstrate the support vehicle that Wrightbus has built to support trials of the StreetAir range in locations where suitable electrical supplies are not available. The MAN box van has been equipped with a standard New Routemaster power generation package supporting stand alone recharging. Powering off for the first chicane, the effect of the regenerative braking was noticeable and only a slight touch on the regular brake pedal was necessary to safely negotiate the bends. Subsequently, with anticipation of where to power off, I found I could complete the circuit using just one pedal, reserving the regular brake for bringing the vehicle to a full stop at the required position. Steering was positive and the lack of other noise meant the power steering pump became noticeable but not intrusive in use. Moving over to the 10.6m StreetAir EV DF, the controls were similar but the cab felt completely different with the less raked front and TfL protective screen requirements. On the track, it was noticeable how different the control system had been set up, mirroring the characteristics of the New Routemaster hybrid and requiring conventional braking into most corners. I can see, however, the logic in having similar driving characteristics across a range of vehicle types which should help consistent driver performance and improve the passenger experience. Like the WF version, the steering was positive and the progressive conventional brakes enabled the vehicle to be brought smoothly to a stand. 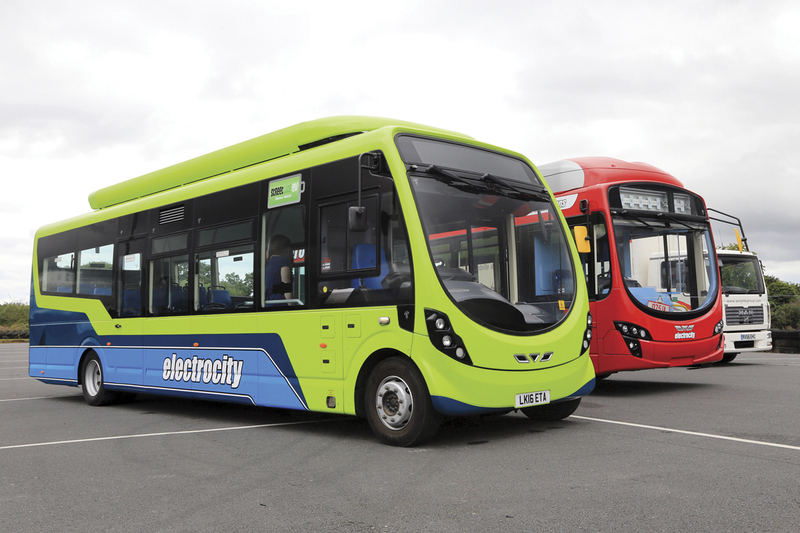 The ride and drive was the first stage of launching the StreetAir product range which builds strongly on the experience Wrightbus has gathered in nearly 20 years of developing an electric solution for city bus transport. Development is not standing still and we can expect to see further advances in StreetAir revealed for EuroBusExpo in November. Production StreetAir EVs are expected during 2017.